We Mangi's ( Mangalorean Catholics) love Pork and for us there is no celebration without Pork :) You will find Pork served at most Mangalorean Catholic Weddings, Birthday parties, Anniversaries, Christmas parties or any happy occasion. 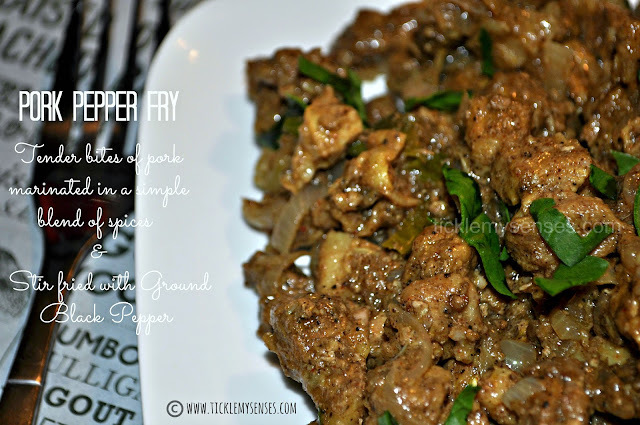 This tasty Pork Pepper fry is a much loved family recipe. Hubby loves it. A very simple dish that requires no elaborate preparation. Goes wonderfully well with drinks when friends are over. Or serve as a main dish alongside a simple rice pulao. To make this dish I use the shoulder of pork (as meat tends to be tender). Dice the meat and marinade it in a simple spice mix. The meat is then allowed to cook till just tender on a stove top with a little bit of water. The cooked pork is then quickly stir fried with Ground Black pepper. Finish off with salt and lemon juice or vinegar. I really enjoy the medley of flavours in this dish. The pepper powder is deliciously hot and the whole spices and seasoning adds an aromatic and beautiful roundness to the tender meat. This recipe was requested by Gladys Fernandes. Gladys thanks for your patience. For those looking for a traditonal Mangalorean Pork dish for Easter day, do give my Mom's much sought after Mangalorean Pork Bafat Curry a go. Serve it with Appams, Neer Dosas/ Panpole, or Sannas. 1. Wash the pork meat and cube the meat into small pieces. Keep aside. 2. In a large vessel mix all ingredients for marinade and let the meat marinade in the spice mix for an hour or two. Add 1/2- 3/4 cup water to the pork, mix gently and cook the pork till tender and done. Add more water if required to cook the meat. Once the meat is cooked, allow the cooking juices to almost dry. 3. In another pan heat oil, add curry leaves fry for a couple of seconds, add onion and fry till lightly brown. Add the cooked meat fry for a few minutes till all pieces are fried lightly. Sprinkle over freshly ground black pepper powder and garam masala powder. Add salt and lemon juice to taste. Serve hot. 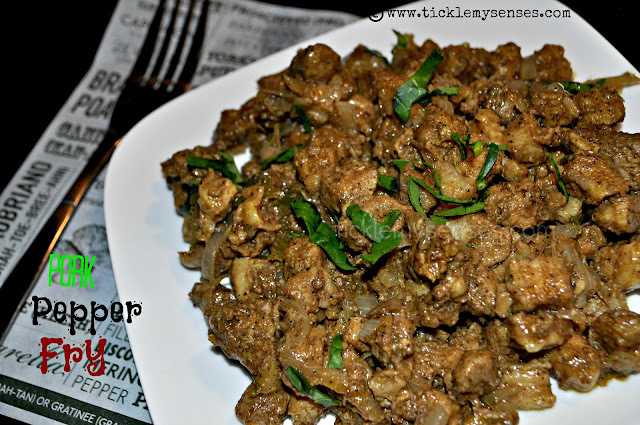 If you enjoyed this Pork recipe please do share it with your friends on Facebook. I would love to hear how you got on with this recipe. Please drop me a line. Might make me very happy and inspire me to bring you more yummy recipes. Want a recipe, cannot find it here? Drop in your request at carol@ticklemysenses.com or on my Facebook Page. I tried this recipe today and god it was tasty! Thanks for the great recipe! PS: The meat came out nearly falling apart when I finished frying, is it supposed be that way or have I overcooked it a bit? thanks! 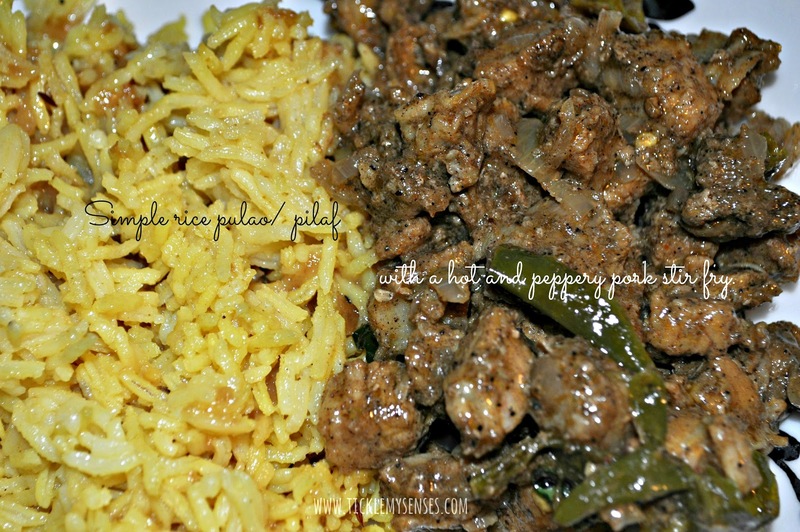 I made this yesterday as an alternative to the usual pork bafat. Easy to make and delicious recipe. The kids loved it too despite the heat from the pepper and green chillies. I made your spicy pork recipe and we all loved it. It is uncomplicated and because of the few ingredients one can get the true taste of the pork meat also. Thanks a lot.